After soaking in the views from the top of Cobb Ridge we headed off down the steep road into the “hidden valley”. 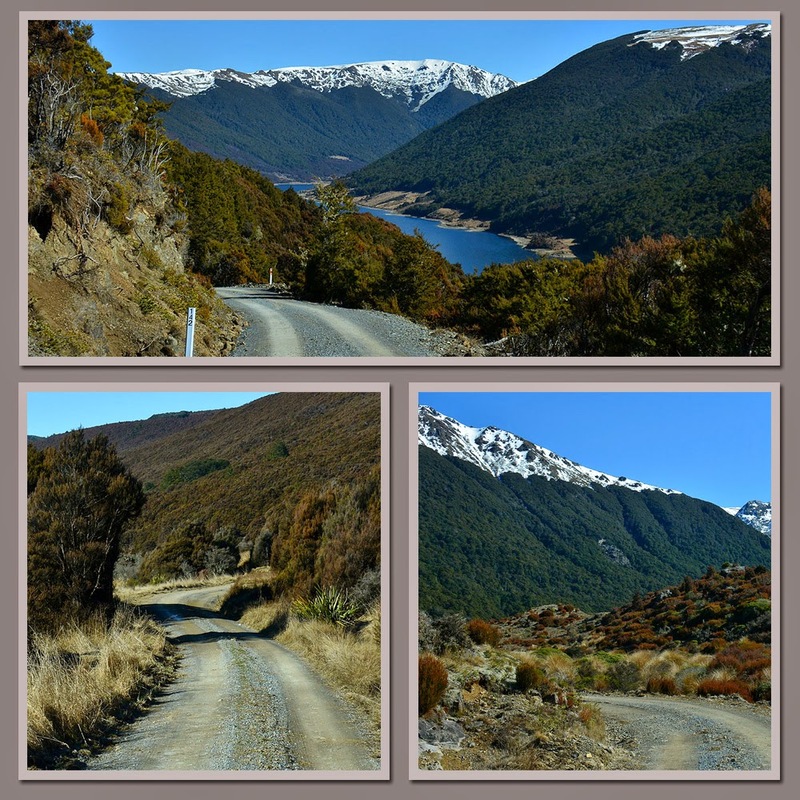 At lake level we turned and followed the road along the lake edge for 10kms right to the head of the dam where the Cobb River flows into the lake and where there are a number of tramping tracks, & DOC huts further up the valley. 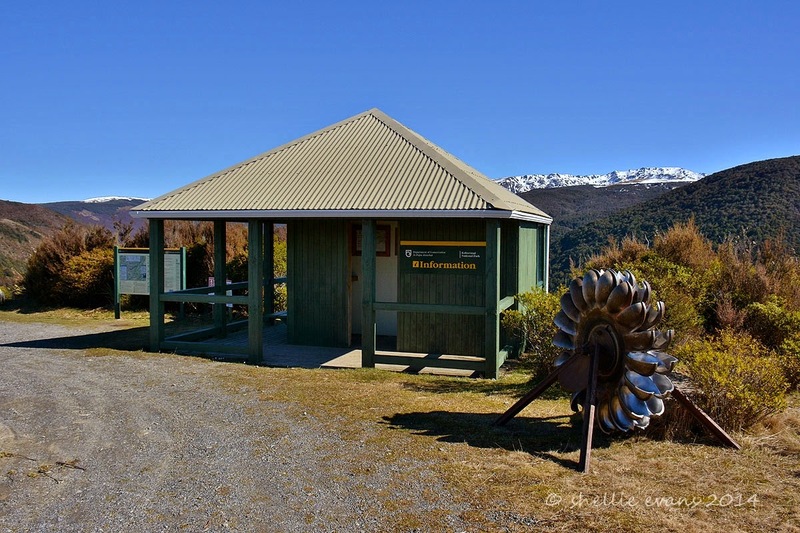 As we approached the end of the road we could see the Trilobite Hut tucked into the bottom edge of the bush below Mt Peel. We could also see that there were a number of cars in the carpark. Something we never get used to; we drive all day on the rugged-ist of roads, out the back of beyond, without seeing a soul or passing any vehicles and then when we get to the end, the carparks are full! Well, by full, I mean 3 cars. Three cars but no people, they must be all off tramping or hunting or mountain biking. There was no one at the hut either. Trilobite is a 12 bunk hut and those are all the bunks right there in the middle right photo, 8 on the left of the door and 4 on the right. You’ll now understand why we only do day walks. 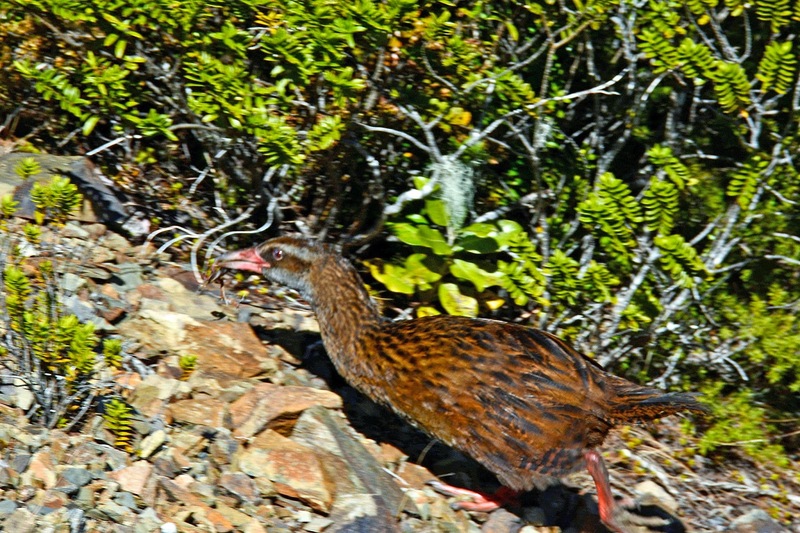 While we were checking out the hut and the beginning of the tracks another weka came striding down the path to see who had arrived. This time I was able to take a few good shots as it moved about the open ground slowly. It came quite close but was quick to take off at any sudden movement. He (or she) was very curious and at one point I thought it was going to even peck at the lens. I noticed that this one had grey legs & bill, with a hint of orange whereas the one we saw at the top of the ridge had bright orange legs and bill. Maybe this one is a young bird or the orange is part of their breeding colours. 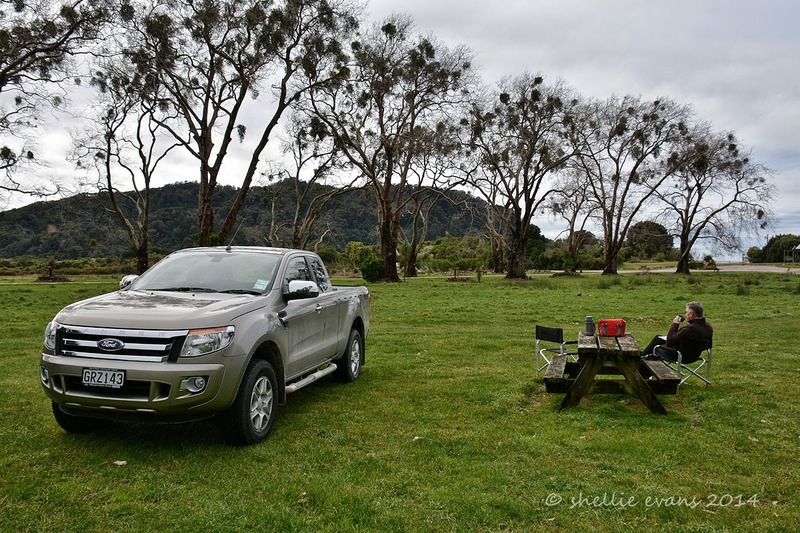 We drove back down the road a few hundred metres to the large tussock covered camping area beside the Cobb River to have a late lunch at one of the picnic tables. I’m guessing that this area would be very popular during the summer but having now driven the road I would say that it would mainly be families in tents or small campervans as anything larger wouldn’t make it through. I would have liked to have done the tramp to Asbestos Cottage but we decided that we’d just explore by vehicle today as we wouldn’t have had time to get this far into the valley and then do a walk. 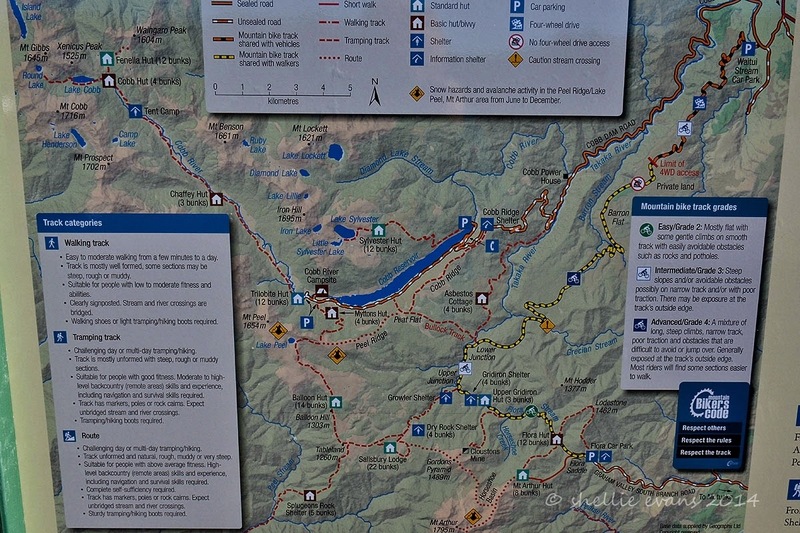 The start of the track left the access road halfway up the range between the power house and Cobb Ridge and finished half way along the road beside the lake. 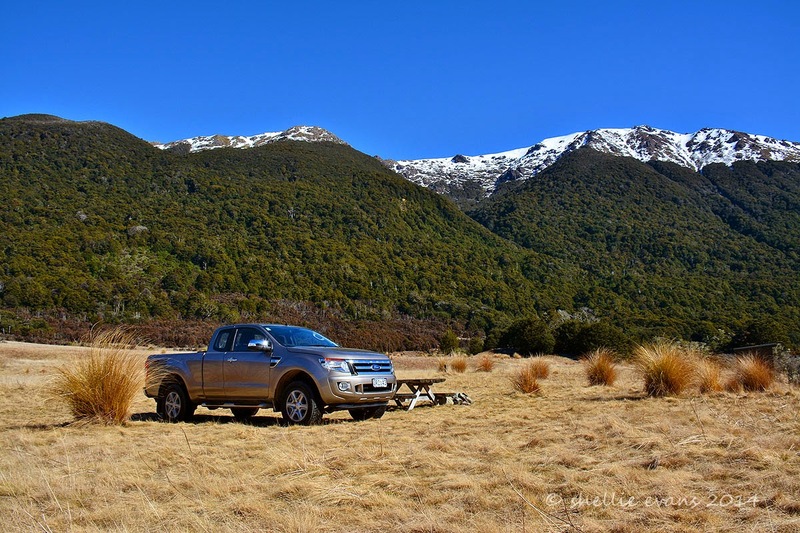 It was 6km to the hut and then another 7km via the Bullock Track to the lake and unless we had someone to collect us, no way of getting back to the ute without walking. And now looking at the terrain, it would have been very tough going. Asbestos Cottage was built in the 1890s by prospectors looking for asbestos in the area. 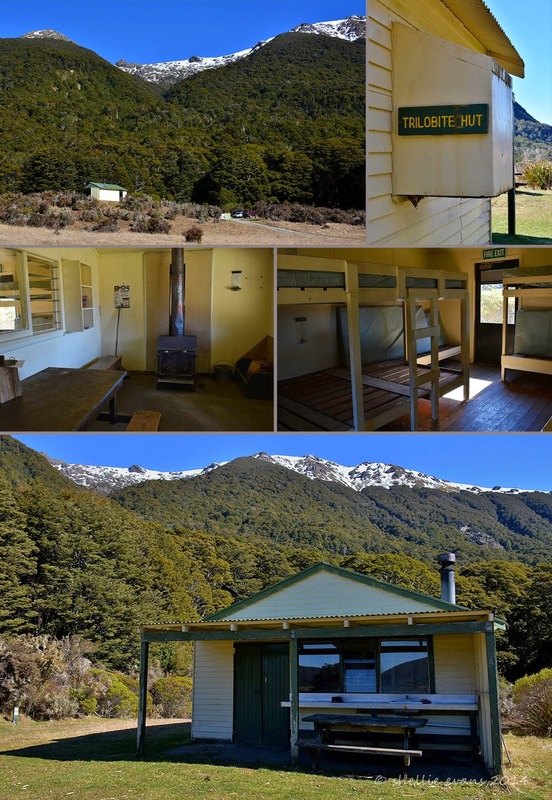 From 1914 this isolated cottage was home to Henry Chaffey and Annie Fox. 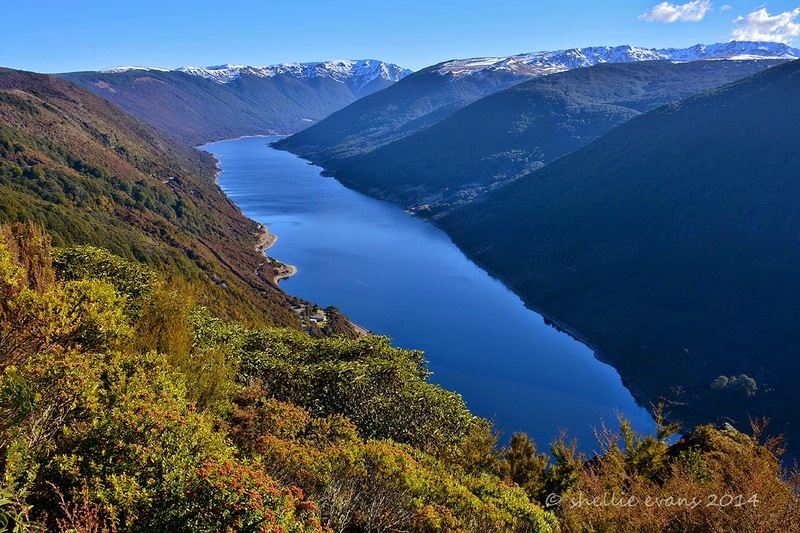 Escaping an abusive husband, Annie left her two teenage sons in Canterbury and fled with her lover Henry to the mountains of the Cobb Valley. The couple stayed as virtual recluses in the tiny hut for nearly 40 years. The couple were largely self-sufficient; Henry would hunt deer and goat, and a well tended garden supplied various fruits and vegetables. The little money they needed was earned by taking rainfall readings for the Meteorological Service and Henry’s gold fossicking. The cottage had a tidy homely interior with walls papered with pages from magazines and mining journals. The large smoky fireplace over which all cooking was done had given the walls and ceiling a brown patina. The floor was covered in deer skins and the few pieces of furniture had covers and white doyleys. Shelves around the walls and in the bedroom were laden with preserves, jams and pickles. From about 1936 a battery driven radio took pride of place in the living room. Almost 20 years after fleeing, Annie’s first husband died and she was finally free to wed. The couple were married at the cottage on 5 April 1932 by both Anglican and Presbyterian ministers. The ceremony was followed by a wedding feast of roast goat, potatoes and bread with toasts of whisky and water. Henry died on the side of the track in August 1951 aged 83. He had been returning from a provisioning trip. 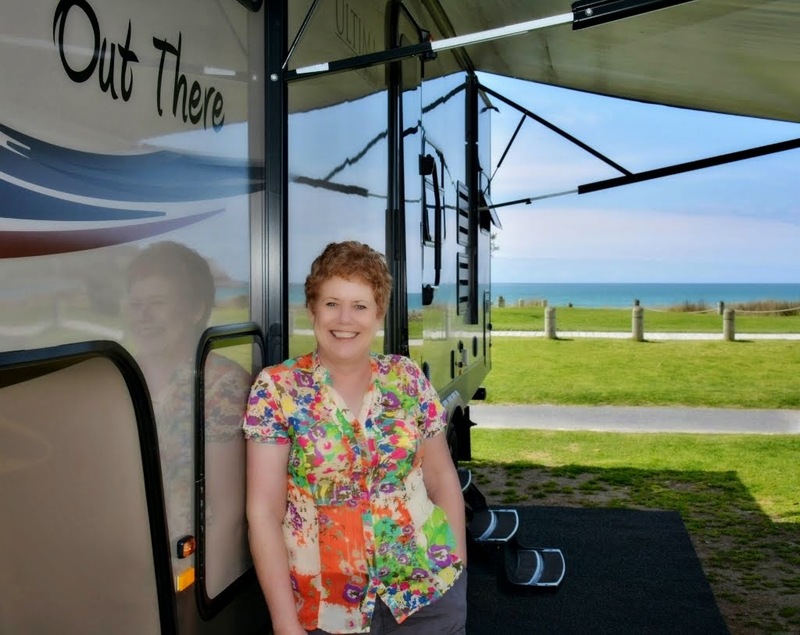 Unable to stay at the cottage by herself, Annie was taken to live with relatives in Timaru. However, she found it difficult to adjust and took her own life on 14 July 1953. What a sad ending to an extraordinary life and how intrepid were the ministers that came to marry the pair? It was a beautiful late winter’s day; warm sun, blue sky, no wind and the whole valley to ourselves, lunch was a leisurely affair as we soaked up the peaceful surroundings. David checked out the river for trout but found none (the season was closed on the river but open on the reservoir). We stopped near the river inlet and couldn’t work out why the water was dirty on the edge. The river was clean and the lake was clean but this area a muddy colour. There were a few ducks milling around but I don’t think they had stirred the mud up, I think the lake had been quite low and had exposed some mud flats. 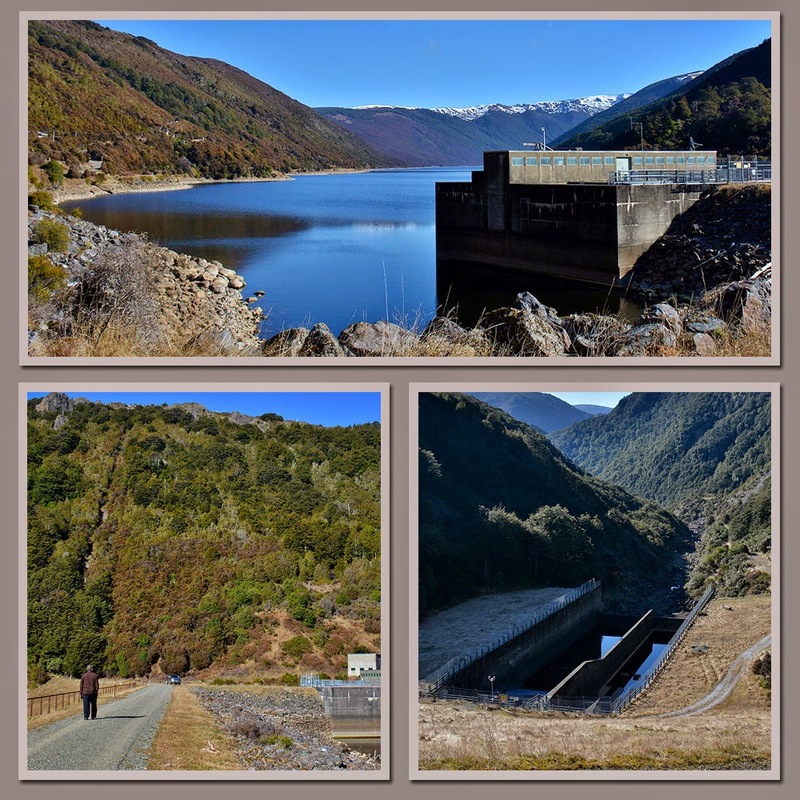 We headed back down the road and stopped at the dam wall and intake to check it out. It was here that we saw our first cars, two with four older couples in them, out on a Sunday drive. The wives sitting in the back and the men chatting in the front. I bet some of those women thought “Where the heck are we going”, as they drove the road in. I know I’d have been car-sick in the back. Here are a couple of photos I took of the information boards back up at the top of the ridge in the shelter (which is up at the top of that line in the bush in the photo above, bottom left). 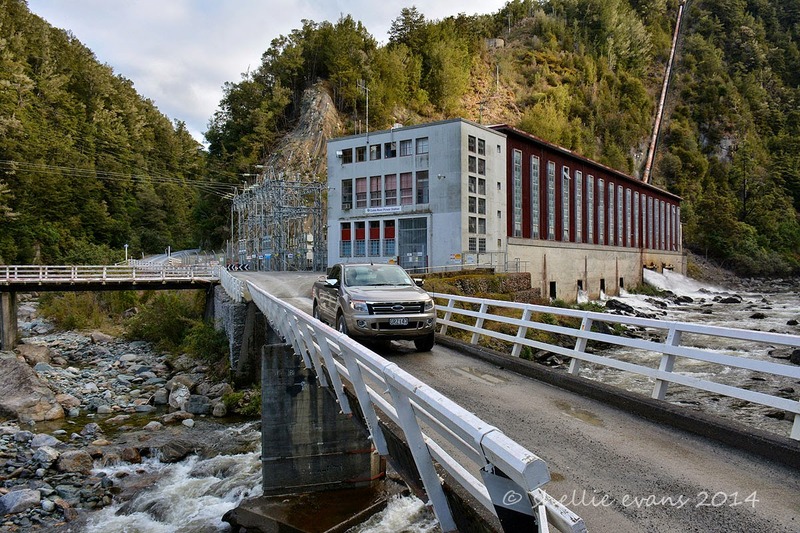 The 596m height between the power house & the penstocks is the highest of any NZ power station which permits a considerable amount of power from a relatively small water flow. The dam was completed in 1953 and has a storage capacity of 25.6 million cubic metres. We wound our way back up to the top of the ridge and stopped for one last look at that fabulous view again, this time taken in the late afternoon sun, before we dropped over the top and out of sight of the stunning “hidden valley”. And one last photo of the power house as we crossed the bridge, this is the one I used for a blog header last week where the 'spent' water is exiting the side of the building. I hope you enjoyed your guided tour of the Cobb Valley, it was a magical place and well worth the 120km round trip to visit it. 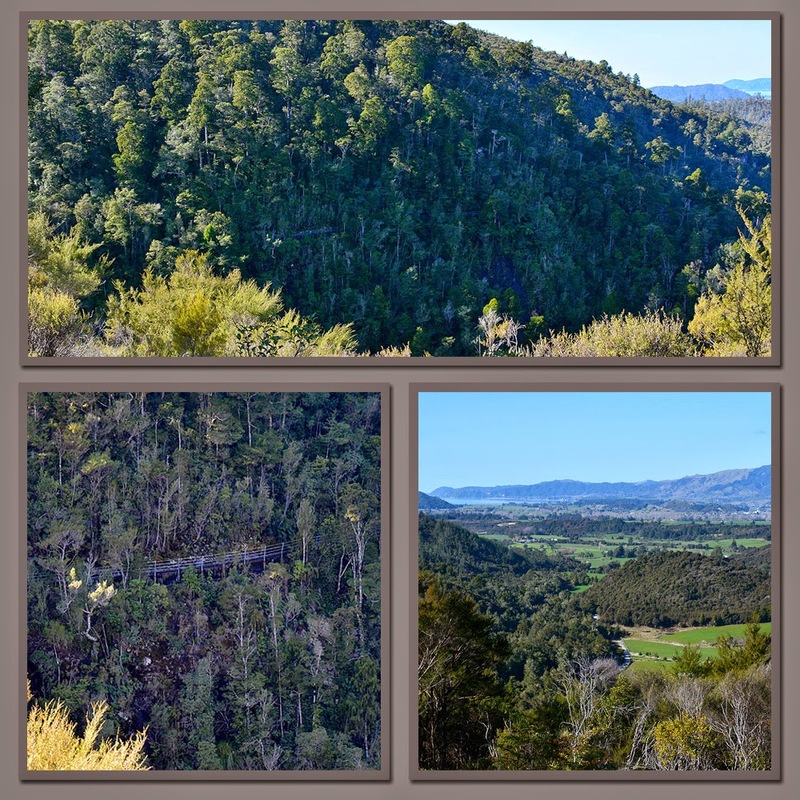 The Cobb Valley is a spectacular hidden valley located 30kms inland from Upper Takaka within the Kahurangi National Park. During the ice age the valley filled with a glacier which then carved the classic U-shaped straight valley, polishing and smoothing bedrock and dumping ridges of moraine (soil & rock) as it went. Today the valley has been dammed to form the Cobb Reservoir. We had wanted to visit Cobb Valley after our trip to Mt Arthur & the Flora Area of the Park a few weeks ago where we saw on the information board that there were quite a number of points of interest on the otherside of the range, which actually wasn’t that far away from Flora as the crow flies. Of course there were a few very large mountains to cross in between, that’s the problem with leaflets & sign boards, they are flat and give a false impression of how difficult some of these tramping tracks are. 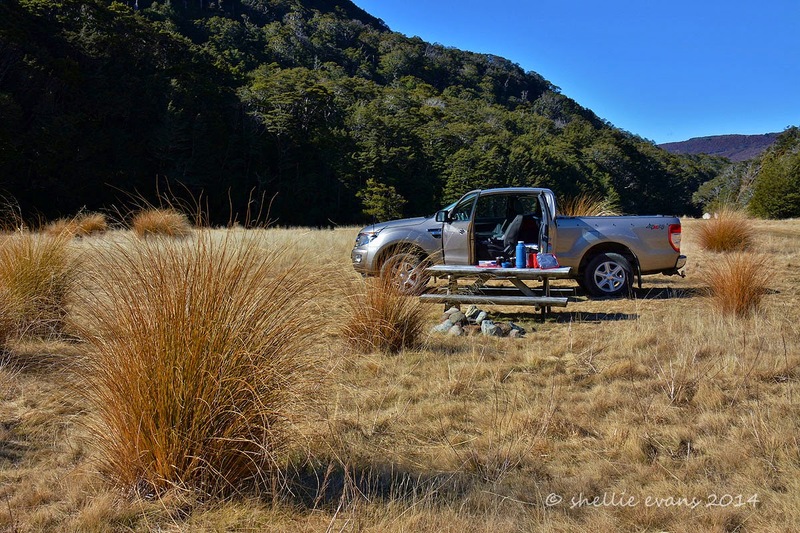 Initially I thought we may have taken the 5th-wheeler someway up the road and freedom camped on the side of the Takaka River but as we had already set up camp at Pohara we decided to do the 120km round trip to the valley. 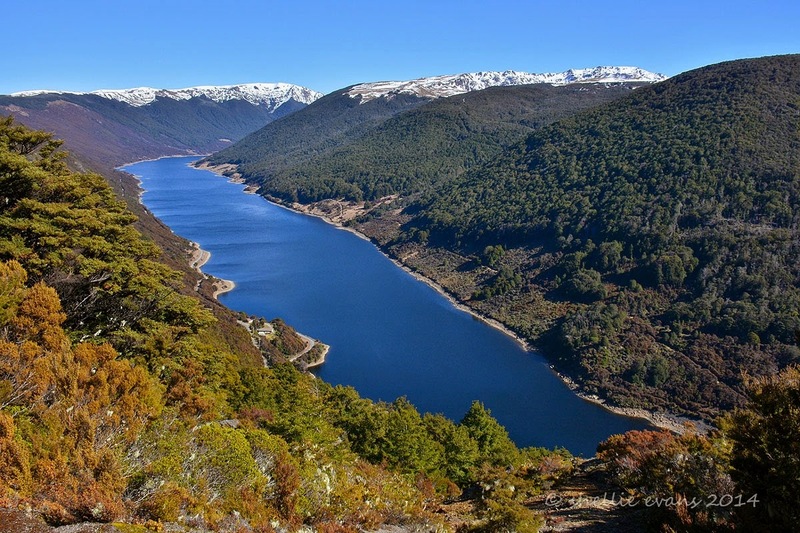 The road was great at the beginning, it followed the river inland and although it was narrow in places, it was sealed for the first 16kms right up to the Cobb Valley Power House. We discussed whether we’d get the van in as far as the Power House and decided that there would be some areas like the one below that might give us a few issues. Solid rock overhangs or vertical walls tend not to move. This shot is a bit blurred, I took it through the window as we edged our way forward hoping that there wasn’t a vehicle coming the other way. 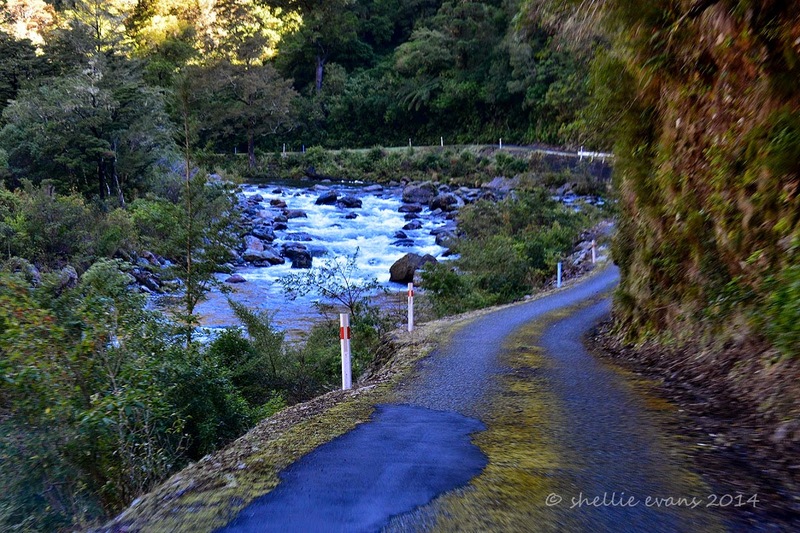 We stopped numerous times along the way so we could check out the river, David for trout & me for Whio (Blue Ducks). We saw neither but at one stop I heard a familiar honking. It seemed to be coming from above and I expected to see a pair of Paradise Ducks fly by. The honking continued but no ducks flew by and the noise definitely wasn’t coming from the river level. So I scanned the trees above us and then spotted a female paradise duck roosting on a dead tree high up in the forest canopy. And beside her but slightly lower and in the shade was her mate resting up too. I wonder how many know that Paradise Ducks land in trees. I have seen it before, there was a huge gum tree at my old golf club and a pair of ducks often roosted in it. I’ve watched them fly in and land on the narrow trucks too, something you wouldn’t think a duck could do. Obviously Paradise Ducks love high points, remember the pairs on the picnic tables at Totaranui? Next stop was the Power House. 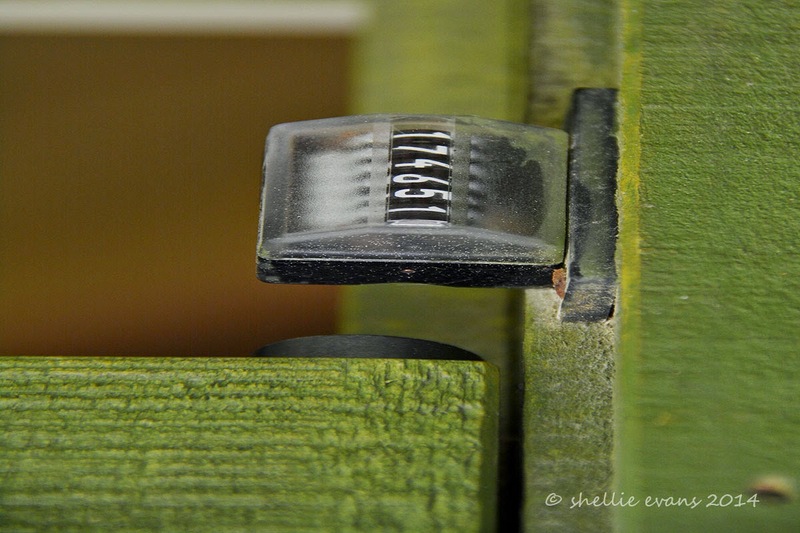 If you’ve been following the blog headers then this will look familiar. Although the header photo was a side view showing all the ‘spent’ water exiting through the side wall of the Power House (I'll post that photo again in Part 2). I’ve never seen water coming out the side of the building like that before. David spotted his one and only trout at the bridge, a large rainbow who obviously knew it wasn’t the season as he was happy to stay put as we moved about above him. Another month and he’ll have to be a lot more wary. The road turned to gravel (custard?) 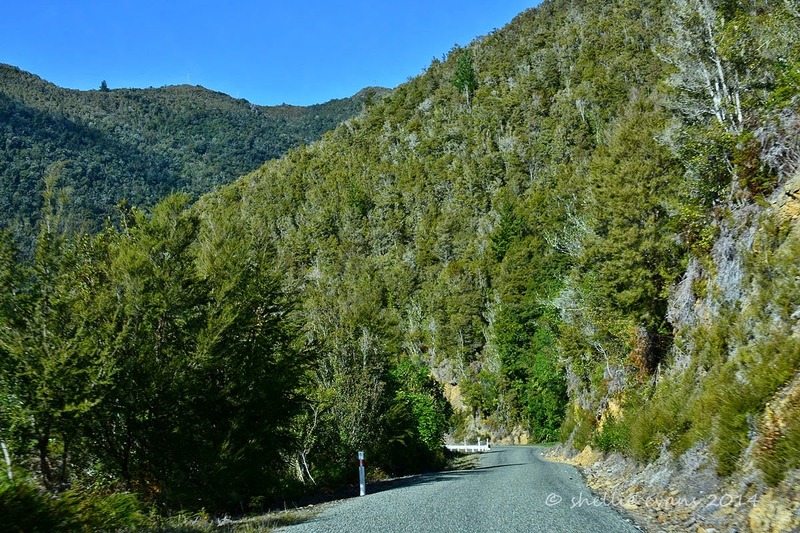 after the power house, it was extremely narrow and wound it’s way upwards through beautiful native forest, we were now in the Kahurangi National Park proper. There were very few areas to pull over if another vehicle approached and we sat on the edges of our seats peering around every bend hoping like hell nothing was coming. Usually the road from the power house to the dam is just a short climb but this one was 6km, 5 of them at a very steep angle with very tight bends right up to the top of the range. And then, as we neared the top, we struck snow again, just as we did at Flora. In fact probably the same snow fall but luckily, there was just one thick ice patch to cross in the shade and a lot on the side of the road. Once out of the bush the road levelled out and we were into an alpine landscape with the Cobb Ridge shelter and information kiosk ahead of us on the side of the road. We pulled up ahead of the shelter and this was the spectacular view that greeted us; the Cobb reservoir stretching up the valley towards the snow capped mountains of the Peel Range. 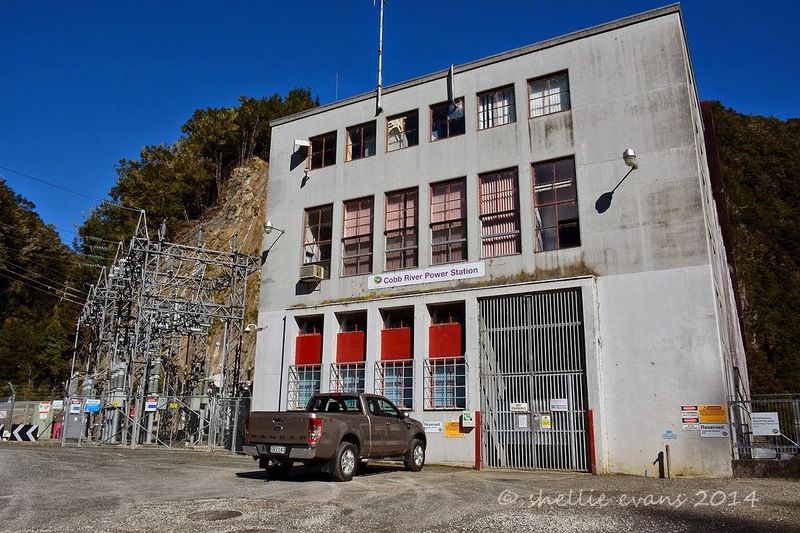 The dam wall and intake are hidden in the bottom right corner, and the building you can see to the left is one of three that house Hydro employees although only one was occupied. The track along the lake on the right is part of the walking track to Sylvester Hut & the Sylvester Lakes, it turns inland and heads uphill at the first valley. The road on the left side is where we’re headed, from the top here, it’s another 11kms to the head of the lake just out of view at the end. While we were reading the information board I caught sight of a movement out the corner of my eye. 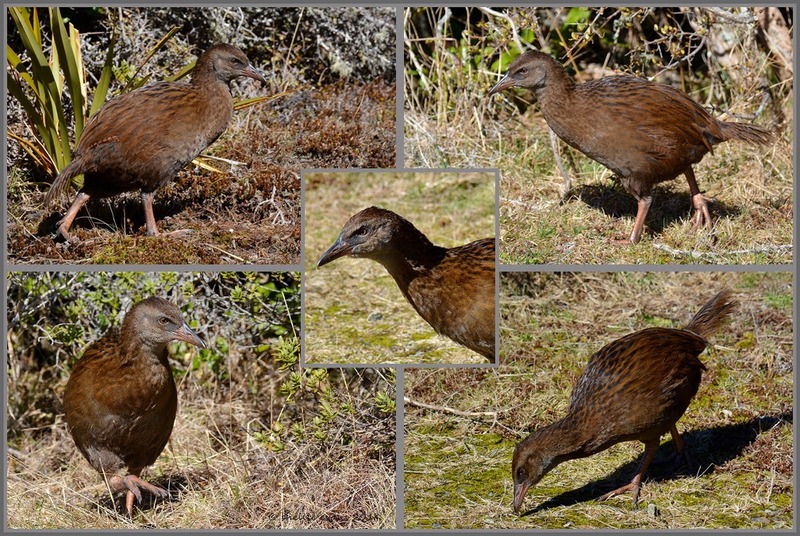 It was a great delight to see that it was a weka, a large flightless bird that has a famously feisty and curious personality. 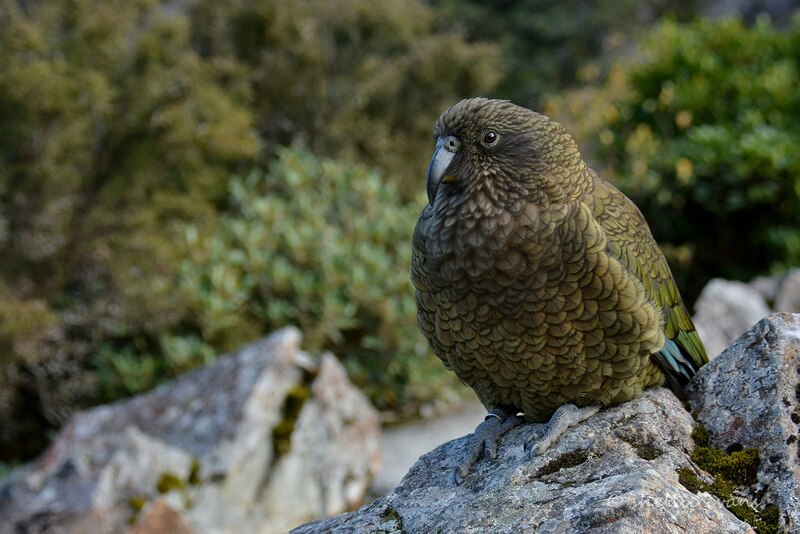 He (or she) burst out of the scrub growing on the steep slope, gave us a cursory glance and strode off around the shelter to the sunny side where it set about preening and fluffing it’s feathers. 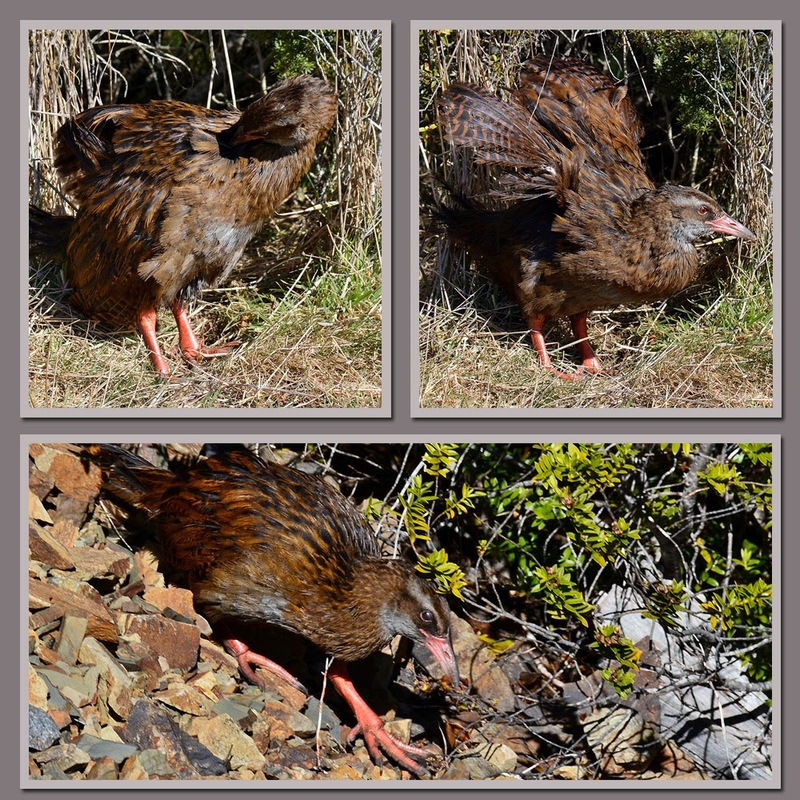 I’ve been waiting to make a weka’s acquaintance, this was our first weka on this trip, another bird to tick off my birder’s list. I’ve seen them a long time ago when we did a trip to the Westcoast but nothing since then as there are only a few small pockets of wekas in the North Island. 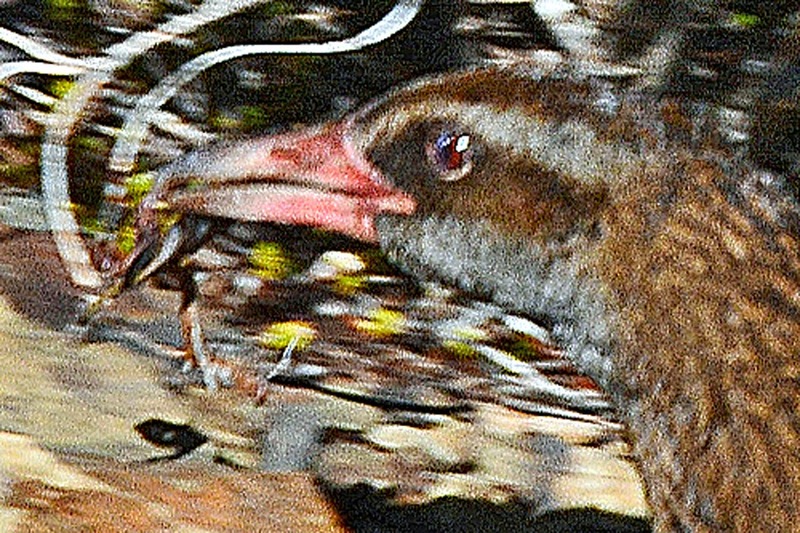 The weka let me get reasonably close but it wouldn’t stay still long enough for me to get a decent shot. And while I was trying to take photos it took off again, straight down a rocky slope in front of it where it suddenly grabbed something in it’s bill from underneath the scrub. It turned around and headed back up the rocks at full speed, crossed the road and disappeared under the bush on the other side, never to be seen again. While I was trying to do the weka photo shoot, I heard a shout. It took me a few moments to find out where David has disappeared to. He had climbed down a bank and out to this marker post right out on the edge of the cliff. It had some sort of measurement indicator on it and there was another post down below on the dam wall with a measurement too. We had a look across the road to see if the weka might make another appearance after it had eaten dinner but all David found was, what was probably the left-overs of his dinner last week. The empty shell of our giant native land snail, powelliphanta. 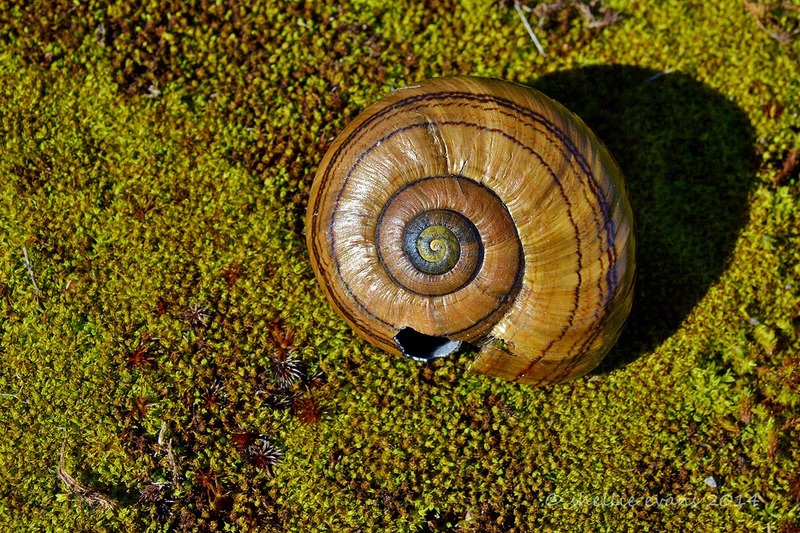 A snail that is greatly endangered and only found in a few areas around the top of the South Island and the bottom of the North Island. I should have taken a photo of this in my hand so you could get an indication of the size but it had about a 50mm diametre (2 inches). Powelliphanta can live up to 20 years & can grow up to 90mm. You can see where a bird has punctured the shell to pull out the body. Another first to add to out list, now we want to find a live one. 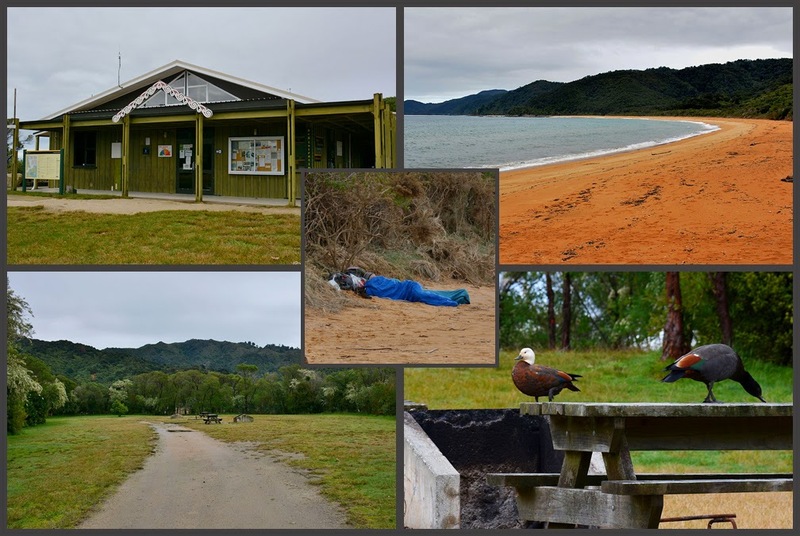 As mentioned in the previous post we took a tiki-tour over to Totaranui to check out the DOC campground and have a look around the top end of the park which we’d only seen from the boat when we did a tour from Kaiteriteri a week or so ago. The road was typical “off the beaten track” which we’re getting very used to travelling now; a narrow winding gravel road up and over a range. There were quite a number of slip repairs and a few very narrow sections with wash outs down into steep ravines below. 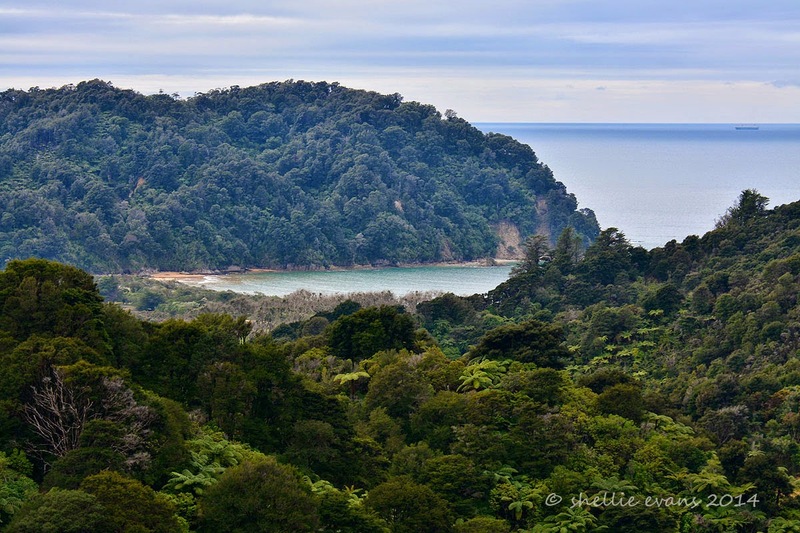 Once over Pigeon Saddle and heading down the other side a small section of the bay at Totaranui came into view. Unfortunately it wasn’t a very nice day, it had rained all night with showers on & off all morning and the cloud hung low along the range. 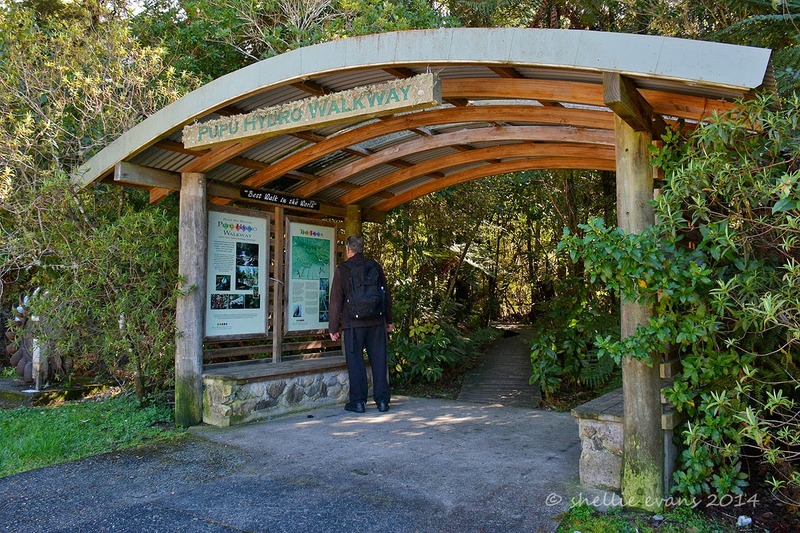 Down at sea level it was a surprise to find this grand entrance, an avenue of trees leading to the beach & the DOC information centre. I had seen the trees from the boat and wondered how they came to be there. The trees, alternate London Plane & Macrocarpa, were planted in 1856 by the first European settler & landowner, Williams Gibbs. He wanted an imposing entrance for visitors arriving by sea. And of course this was the only way people arrived, there were no roads back then. Gibbs established a farm of over 7000 acres and supplied Nelson with milk & dairy products. He also built two holiday cottages that he rented out to holiday makers. Even back then this coast was a popular holiday destination. Sadly the Macrocarpa looked to have succumbed to disease or old age as there were only large stumps in their spots! 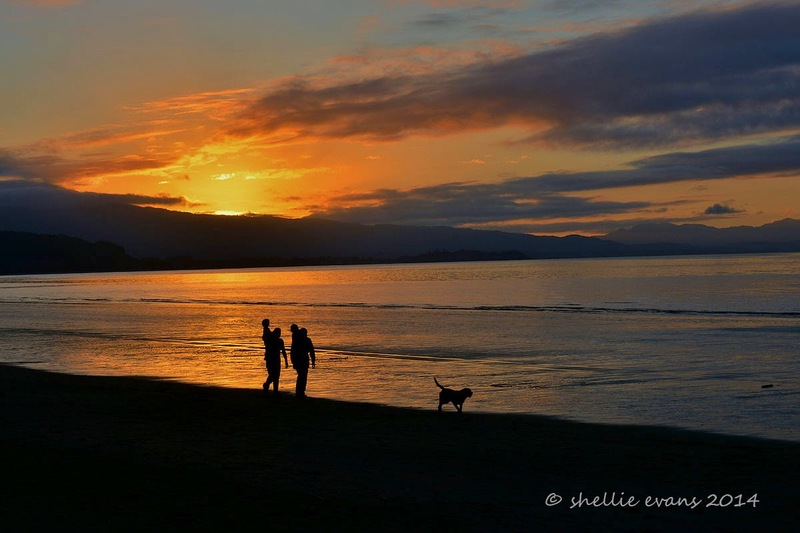 The campground is huge, it is the most popular DOC campground in New Zealand and over the summer holiday period there are over 1000 people in camp. Today there was just us, a few pairs of Paradise Ducks, each with their own picnic table, and this couple asleep on the beach! I’m assuming they can’t afford the $20 to pitch their tent in the campground. The campground is partitioned off into blocks, sheltered by native bush and lettered from A to Z with at least two-three dozen camp sites in each section. We walked right around the campground, the beach out front and along the estuary at the back. There was some great sites tucked out of the way but we decided that it would be better to stay here when there were a few more people around. We like it remote & wild & we like it without crowds but this was ridiculous, not a soul in site except for the sleeping beauties out front. Maybe we'll come back during the summer if we come this way again. We found a picnic table that hadn’t been taken over by a pair of resident ducks (they were in the grass in front of us) and had our lunch overlooking the avenue of trees while being attacked by a hoard of sandflies; the first ones we’ve come across since summer. And just to prove how popular this campground is, take a look at that number on the counter above the toilet door! And it only moved half a notch each door opening so wasn’t counting two for one. 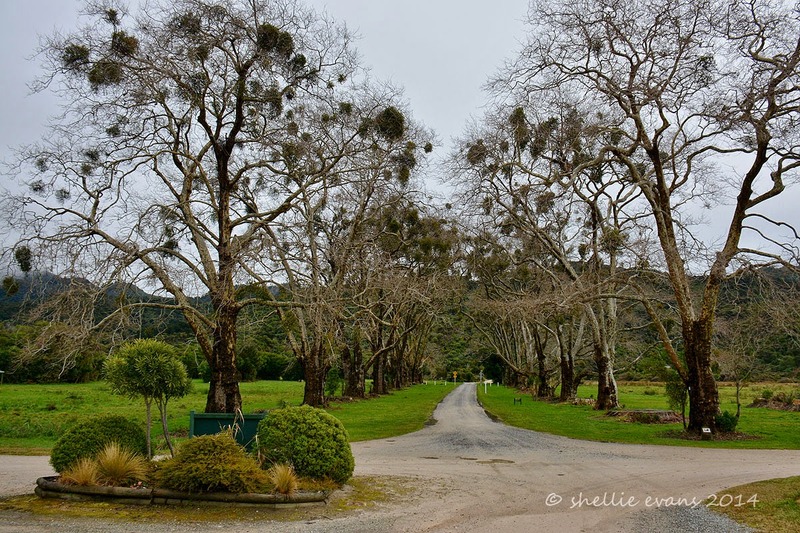 Up the road and behind the estuary is the Ngarata Homestead. 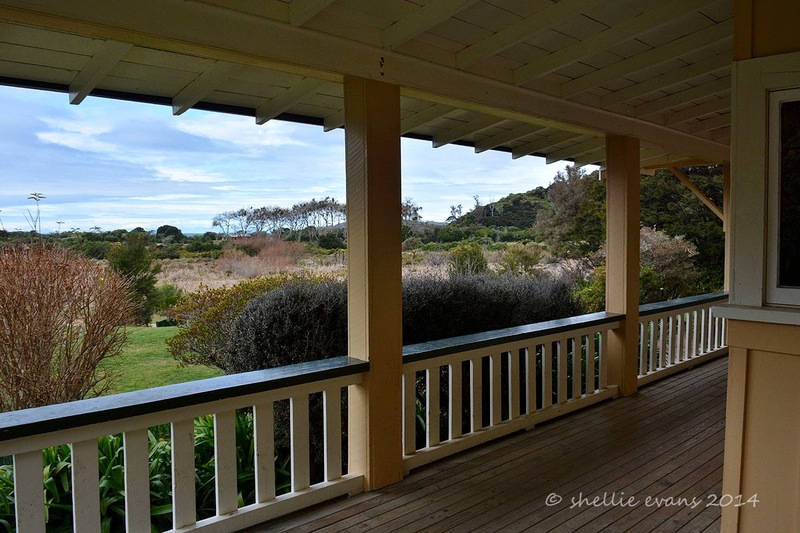 Ngarata was built in 1914 for the Pratt’s son Bert, the Pratts purchased the farm in 1892. William Gibbs’ original homestead was also located along this ridge but was burnt down around 1924 after which Ngarata became the main homestead. 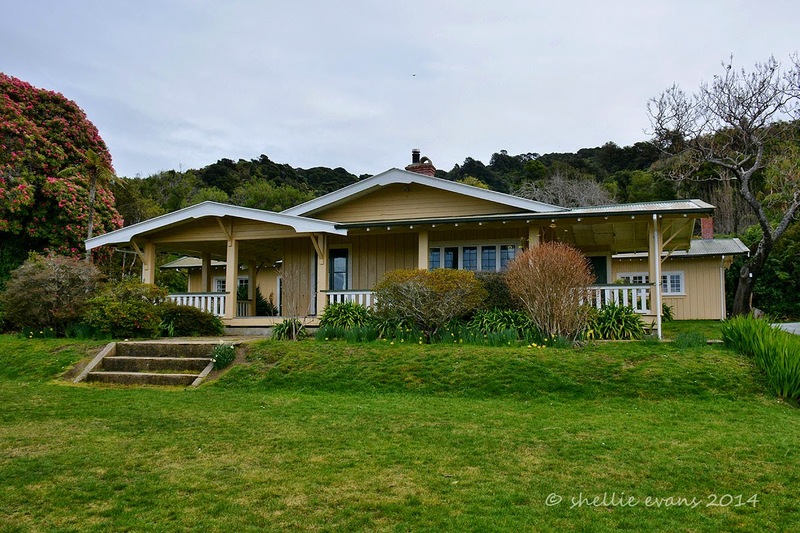 Ngatara was built in the very modern (for the time) Californian Bungalow style and is one of the very first examples of this style in New Zealand. The homestead now belongs to the Crown who purchased the land & property in 1948, it’s maintained by DOC and is used for school educational camps. The view from the extensive & broad veranda, The Avenue can be seen in the distance. Old photos on display show women in long flowing petticoats & skirts with parasols walking in the gardens and looking out from the veranda. What a grand but isolated life they would have lived. 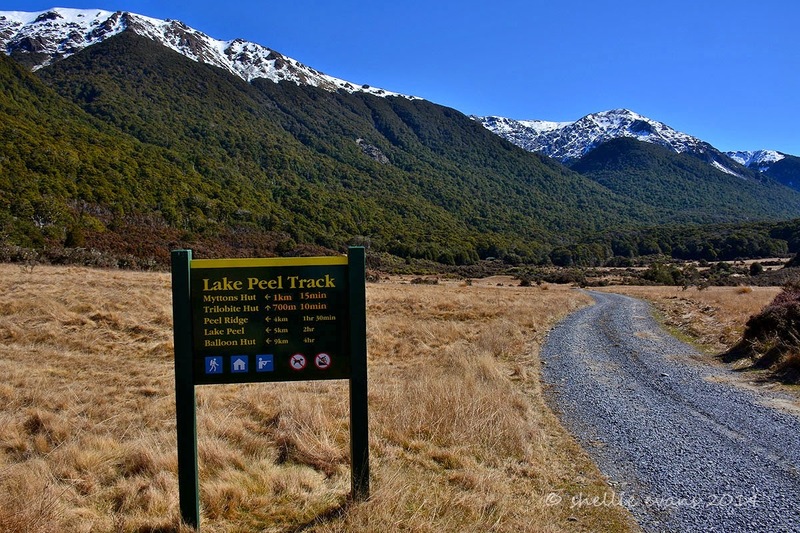 Nowadays the track for the Able Tasman Great Walk passes right by the house. 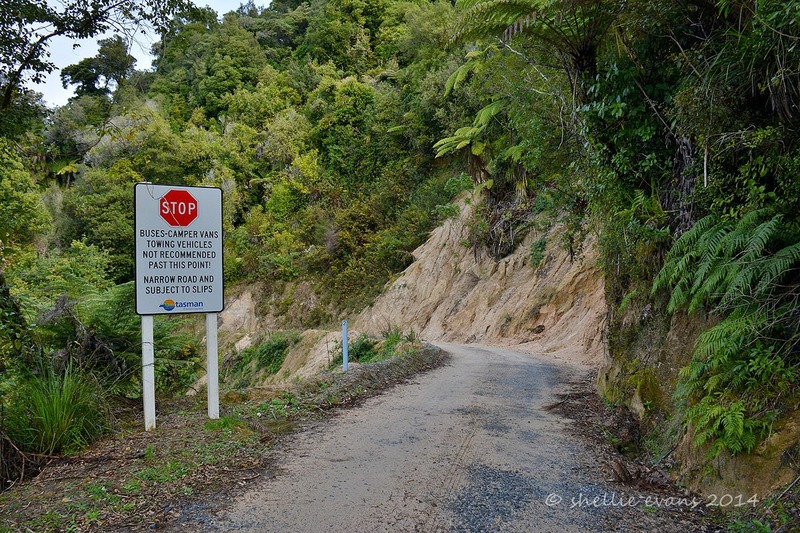 We left Totaranui and headed back up the hill and as we passed the turn-off to Awaroa (another remote camp on the Abel Tasman Walk) we decided we’d take a look down there, we backed up and turned down the track. Which was just as well because that was when we came across the motorhome that had slid off the road. Once things were under control and the travellers were waiting for the tow truck, we continued on past them and down to the Awaroa Estuary. The road down was extremely narrow and once we got to the bottom there were two fords to cross and a whole lot of sand covering the road. This section was prone to flooding and going by all the debris, a flood had passed through recently. 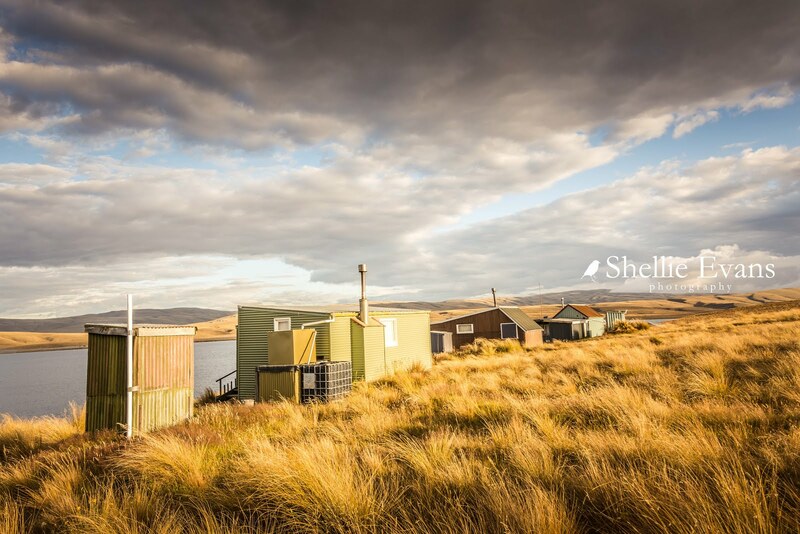 From a grassy carpark beside the estuary we could see across to the DOC hut & a lodge located in the bush below the hill. Walkers on the Abel Tasman must cross this estuary at low tide, there is no high tide track like we had on the section we walked. Around the back of that hill and located on the beach are a number of baches (holiday homes), they can only be reached by water and their dinghies were lined up under the trees on the shoreline below the carpark. Talk about getting away from it all. 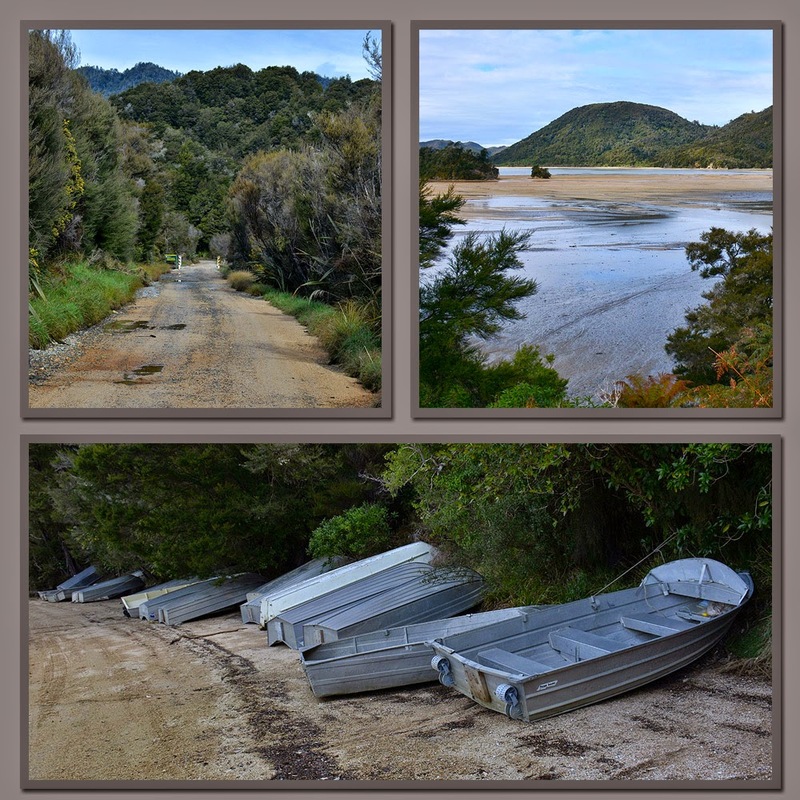 Not only a 20km gravel road to drive but a 3km dinghy ride at high tide before you're home and hosed. And probably the true white gold going by the price per kilo of this tiny little delicacy that has had ‘baiters’ fighting for space on riverbanks around New Zealand these past two weeks. Not only are they being very wary about giving anything away about where their “spot’ might be but also keeping very tight lipped on how successful they might have been. Their prize is the tiny transparent whitebait that run in shoals upstream each spring to spawn and can sell from $70-80 a kilo. Whitebaiters may be very coy, that is until you reveal that you’re not there to fish and that you just happen to be passing through the area just as the season has opened. Then the twinkle in the eye & the animated discussions reveal the trials & tribulations & that there have been a few big runs already and so early in the season. The ultimate Kiwi delicacy, whitebait is an iconic part of our heritage where the start of the 3 month season is looked forward to all year by die-hard whitebaiters up and down the country. Once a whitebaiter, always a whitebaiter; with nothing more than a net & some luck on your side some ‘baiters fish every day from dawn until dusk, rain or shine, dreaming of that big run. Many rough it in the great outdoors, setting up camp along the many waterways. My mother’s family have a long history of whitebaiting in Hawkes Bay, some still regularly whitebait. My grandfather was the epitome of Barry Crump’s “ A Good Keen Man”. From high in the mountains reaching down to the sea, if it moved, it was shot or caught, killed and eaten and if there was anything left over it was sold off down at the pub. 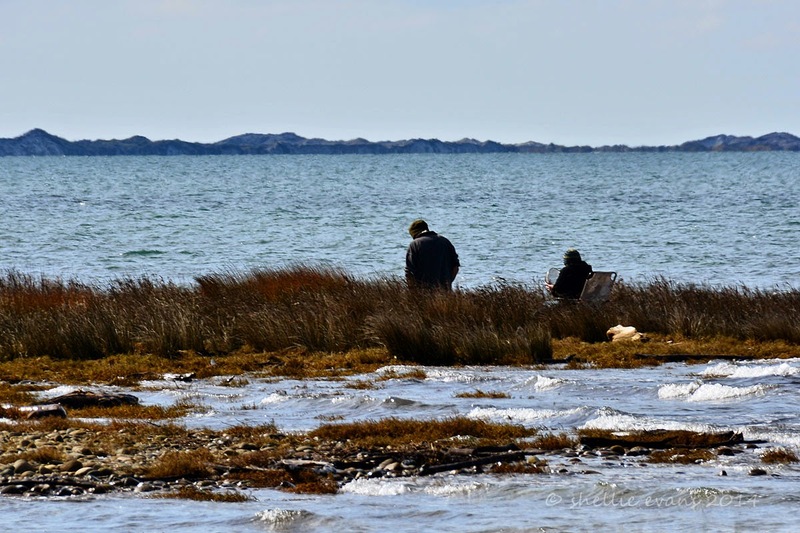 Whitebait was no exception, I learnt the art of whitebaiting (sitting & waiting patiently) from my grandfather. Against regulations, he would have multiple whitebait stands on the river and he protected these by manning each with a son or daughter, or a grandchild (some of us are of the same generation). It was great being outdoors but I’m sure we must have got bored because I do remember once having a whitebait eating competition with my uncle. That's live whitebait, straight out of the net. And out of sight of grandad of course! So when this “home kill” butchery with the strong message, which we pass every day, changed one of the window signs we were quick to stop. It had been caught that morning and about a kilometre down the road where we’d seen a regular procession of whitebaiters vehicles lined up everytime we’d passed over the bridge. $35 for half a kilo (plus a couple of extra spoonfulls for free) and I had enough whitebait to try out a number of recipes I had filed away for exactly this event! 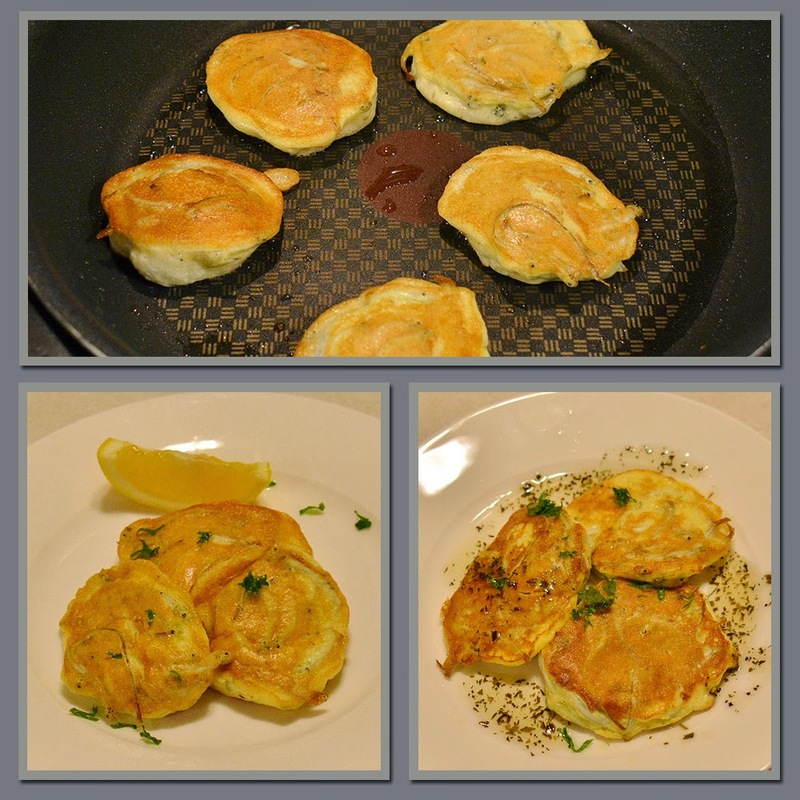 Most people have whitebait in fritters, but there are quite a few different ideas of what the batter should be made up of. 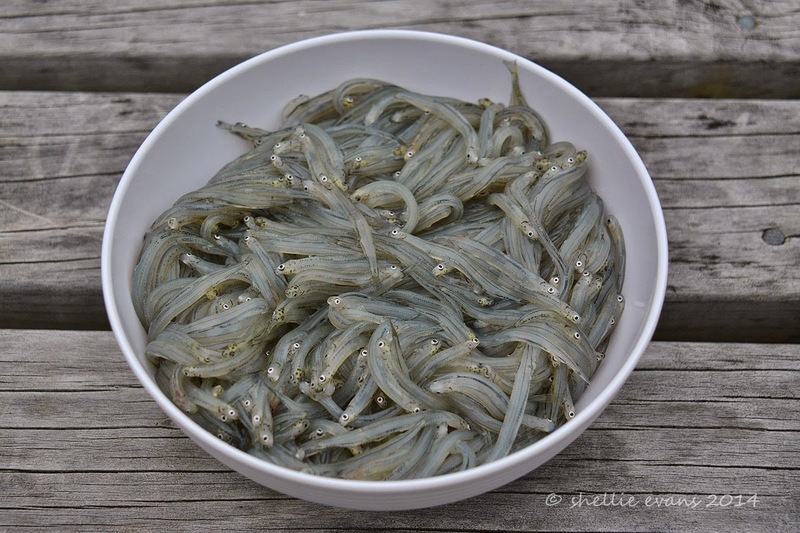 Whatever the batter, it mustn’t mask the delicate flavour of the whitebait. Some people swear by just a beaten egg, others add flour and some add just breadcrumbs. My first lot of fritters were two whisked eggs, a tablespoon of lemon juice, salt and pepper to taste. I made a yoghurt (should have been sour cream but I had none), horseradish cream, dill & chopped capers which was tasty but totally unnecessary as it killed the flavour. I didn’t wash the fish (I thought that would also kill the flavour) but we both thought the flavour had quite a strong fishy taste (funny that). I think I should have also cooked the fritter for a little longer as they were a little “wet” in the centre. I was worried about overcooking them. Next was deep fried individual whitebait. A long time ago we had a memorable meal at our favourite Christchurch restaurant (Saggio di vino), the entree was a half avocado with individual whitebait (about 15!) scattered across the top with a balsamic & olive oil dressing. It was delicious. A salad (and a sliced pear) took the place of an avocado and I don’t have a deep fryer (not that the oil has to be too deep for these tiny things) so I fried them in pan after dusting them with seasoned flour. And I washed and dried the whitebait before flouring them, so they didn’t spit in the pan. It was an interesting exercise, I liked them straight out of the pan but they went cold immediately (obviously) and were a little chewy. Next up and for the last of the whitebait, were fritters again. But this time it was a lightly beaten egg yolk & a tablespoon of flour plus seasoning with the stiffly beaten white folded in. This was the winner for both of us, lovely and light with a delicate flavour. Just as I dished up the last of the fritters I remembered a conversation I had had with someone on our travels who suggested a light drizzle of mint sauce enhanced the experience. I had to think hard about where and who and after a gentle prod from someone with a “mint sauce history”, I remembered it was while lined up at the whitebait stand at the Bluff Oyster Festival. So I added mint sauce to my fritters and by-crikey I liked it! Funny that, but not so unusual considering I am a Kiwi kid and once had mint sauce on everything. And the person with the history? Rachel, David’s daughter once showed us how to get the last of the sauce to the top of the bottle. “You spin the bottle like this”, at arm's length around and around like a windmill. You just have to make sure you’ve shut the lid down firmly don’t you Rachel? Dairy farming is the primary industry here in Golden Bay, there are dairy herds and cowsheds at every bend in the road and “cow crossing” signs with a flashing light on nearly every straight. I don’t think Transit NZ have enforced the stock underpass rule on this side of the “hill” so it’s a new novelty; stopping to let a herd cross the road. Some of the road crossings have a mat laid down for the cows (this is to protect the road not the hooves) & I saw one that had a hose set up to wash down the road after they had passed. 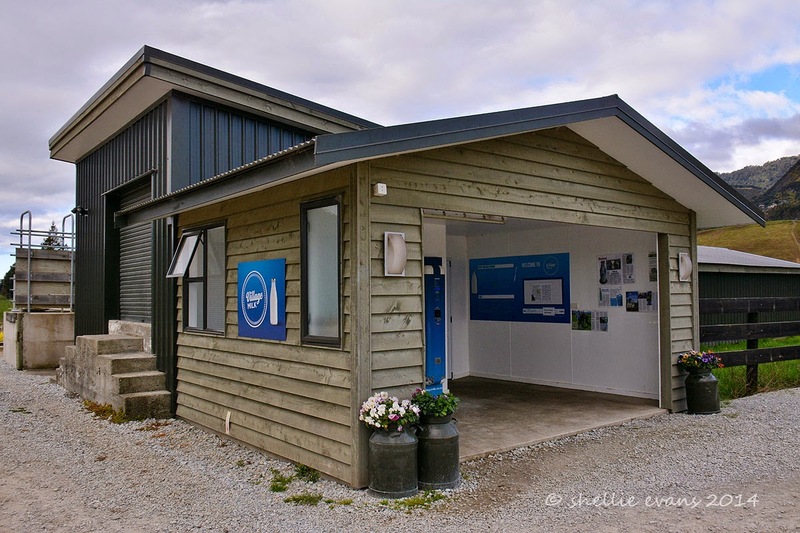 There’s a good sized Fonterra Dairy Factory on the outskirts of Takaka and we pass the milk tankers regularly while out exploring the countryside. I had imagined Golden Bay, the area, to be a wide plain but in fact it’s a rather narrow coastal strip backed by mountains and ranges with smaller farm sizes that would suit dairying. Dairying & tourism look to be the main earners here although tourism has taken a back seat (and that’s in a people mover) over winter. As we drove out to Pohara & our campground on the day we arrived in Golden Bay I spotted Village Milk. I knew all about Village Milk although I was surprised to see it on our road. Just a few days before I had listened to Country Life on Radio NZ and the main feature was on Village Milk. 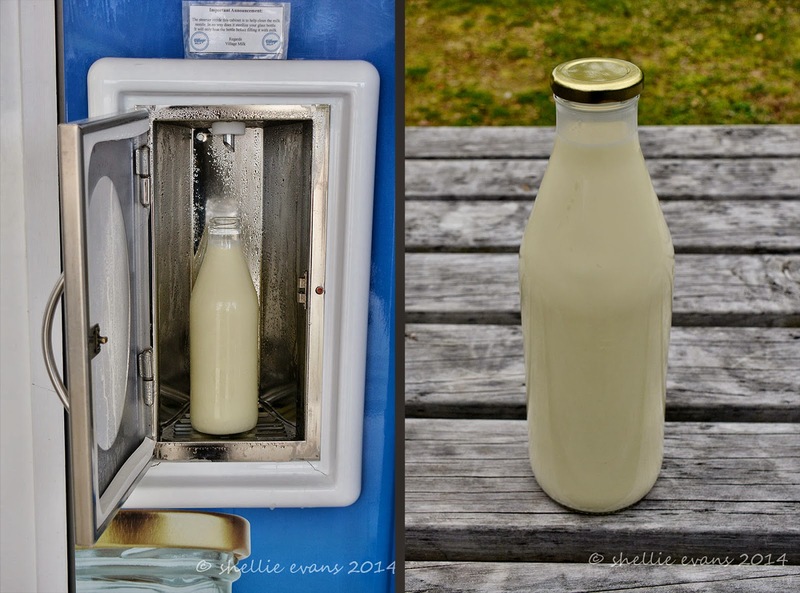 Village Milk sells “raw” milk through a vending machine set up in their yard on the farm. The milk comes from a small pampered herd of just 22 cows. This is the modern day version of taking the milk billy to the cowshed and filling it up from the vat (like we used to do on our dairy farm). 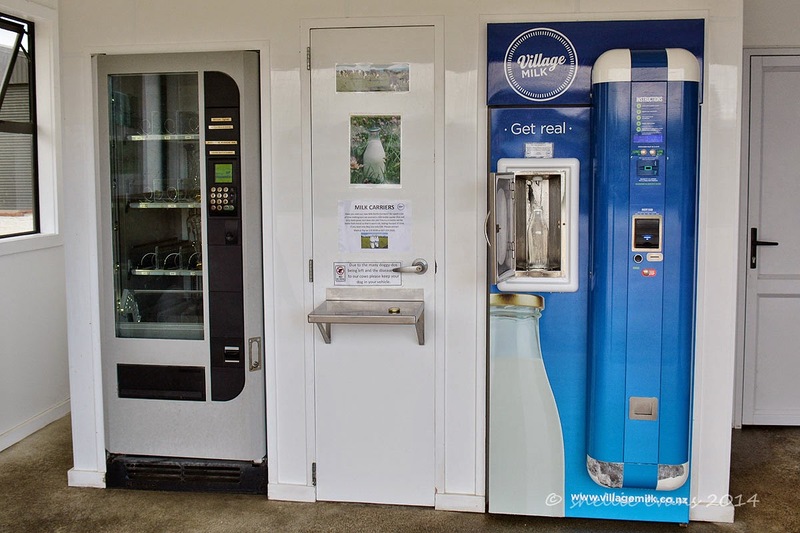 Here you buy a glass bottle ($4) out of the dispenser (or bring your own), load it in the small cabinet where it gets a quick burst of steam to clean the milk nozzle which then fills the bottle. At $2.50 a litre it wasn’t much more than my usual milk costs, if not the same as some of the places I’ve been purchasing it. 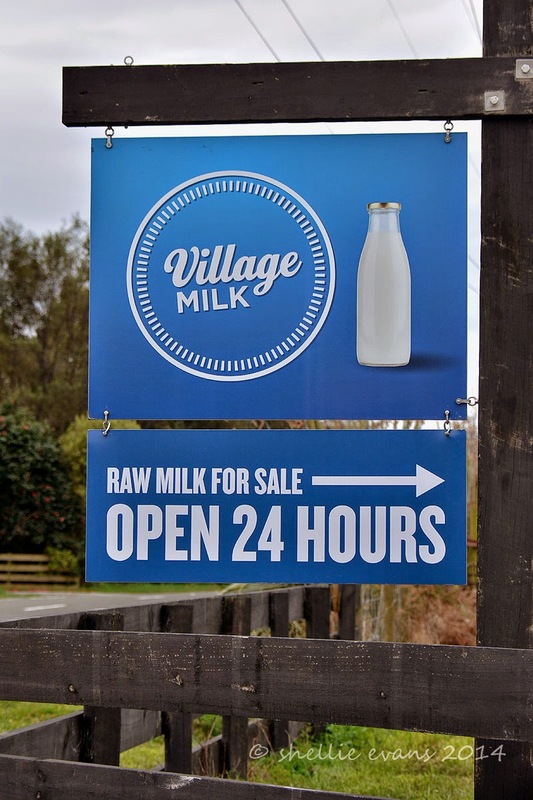 Because it’s not pasteurised raw milk is not widely available, but the current Food Act allows people to buy up to 5 litres of raw milk at the farm gate for personal or family consumption. Village Milk has been franchised into a few other areas too. It isn’t pasteurised, homogenized, processed, over-handled, heated, extracted, spun, or had anything added to it. Village Milk is real milk. It's unmodified. It comes out of the cow and goes into the tank. In the real product you've got all the enzymes, the vitamins and the access to minerals that the milk provides and there's a huge amount of benefit there. With processed milk a lot of the vitamins and all the enzymes are gone and in terms of homogenising, the access to the minerals is largely gone as well. Pasteurisation served a very valuable purpose back in the 1920's when tuberculosis was spreading through meat and milk. Pasteurisation enabled all the harmful bacteria to be killed. We don't need to apply this process to our milk now. All our animals are TB-free and have been for decades. But I wasn’t interested in the sell job, I just wanted to see how it tasted, see if it reminded me of the milk from my childhood. I don’t know why though, as I don’t like cream and I knew raw milk would taste very creamy. I’ve never liked cream, even as a child (although whipped cream is fine). But I do LOVE milk, ice cold milk, skimmed to within a millimetre of it’s life and drunk straight out of the bottle. In the middle of the night is best! So I knew this would be creamy but I wanted to taste it anyway. And of course it tasted different but I’m not so sure it was because all the goodness was left in it or the fact that I forgot to shake the bottle so I poured myself a good sized glass of cream! Yuk. I know we both didn’t like our cup of tea the next morning, it was far too creamy. So now I have a bottle that I can transfer my bought milk into. A heavy bottle according to David, yeah that’s sure to break the camel’s back. Not. And drinking milk out of glass in the middle of the night is a much better experience too. 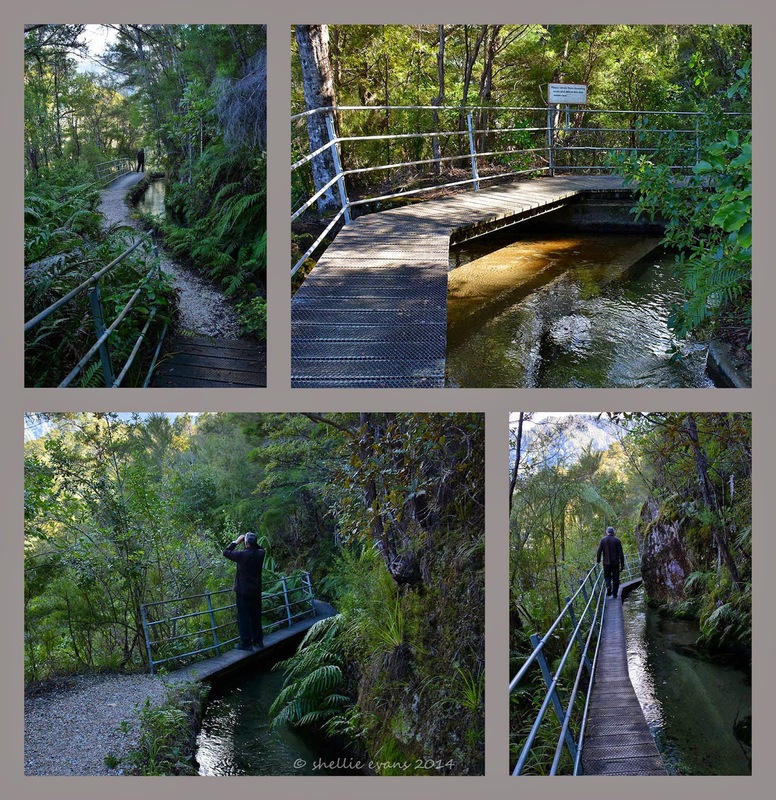 Located further up Pupu Valley from the Te Waikoropupu Springs is a rather interesting loop walk. 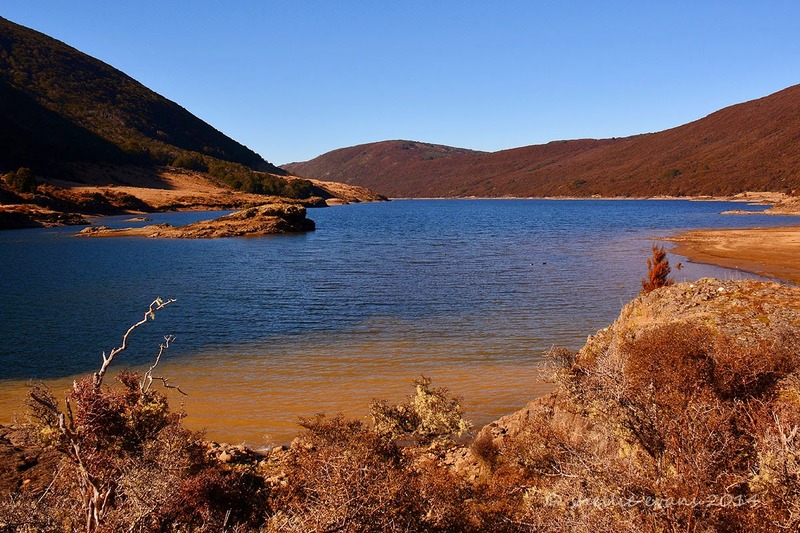 The walk retraces an old gold-mining water race, which has been reused for power generation from early last century. After a major fault developed in the early 1980s (what engineers call a “flashover”) the power station was abandoned. 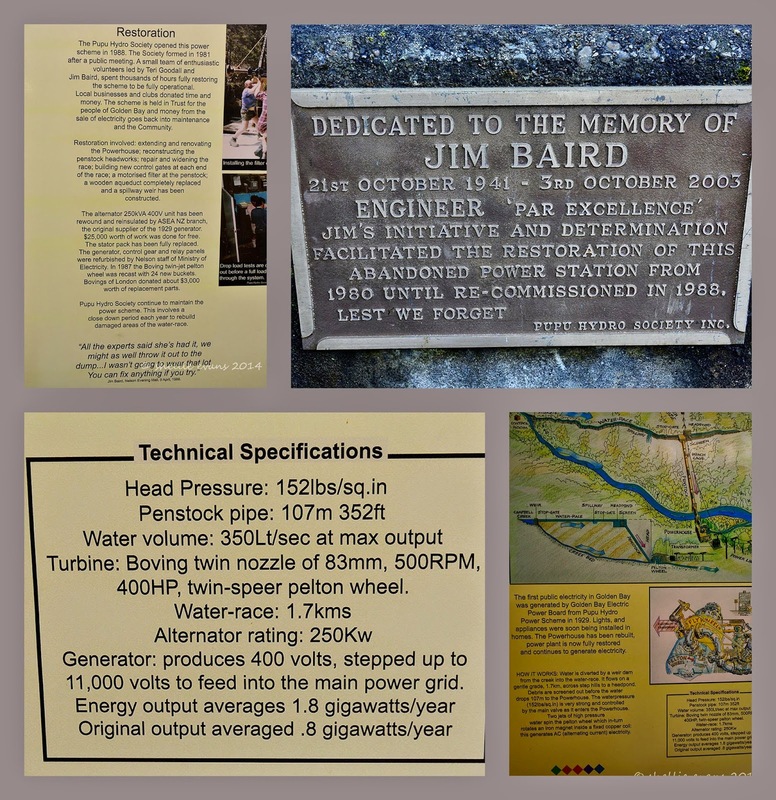 But due to one man’s determination and the hard work of many, the power station was fully restored along with the water race and headpond, and began re-generating power again in 1989. The climb to the water race is a little steep and at times awkward for those less nimble footed. It felt like we were actually in the old water race at times but eventually after 30 minutes or so of steady zig-zag climbing we broke out onto a flat and level walkway that then followed the old disused gold mining water race ‘upstream’ along the side of the hill deeper into the valley. The complete water race stretches for 3.7 kilometres along the hillside and took 24 men eight months to complete. 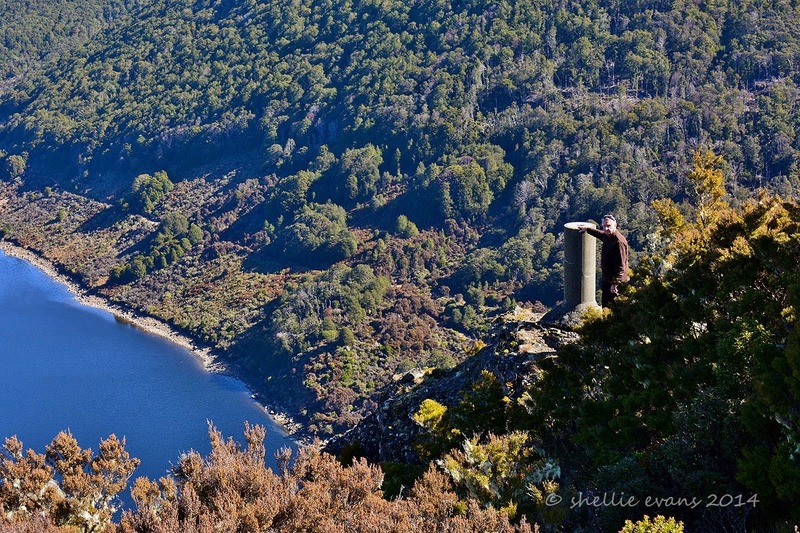 About half way along we reached a lookout point beside the headpond & above the power station deep in the valley below. Here the pond sends the water through a debris collection screen and into a pipe that drops the water 107m to the powerhouse below. From the headpond to the weir/intake it was 1.7km and this part canal/part aqueduct, which was an engineering masterpiece for its time, followed the steep contours of the hillside all the way. It had a narrow boardwalk running alongside it for most of the way. This was the section that was restored & rebuilt back in the 1980s. For most of the way, trees & ferns covered our view out into the valley but occasionally an open area on the edge of a rocky cliff allowed us to see out. The water in the race was very fast flowing, it was crystal clear and there were plenty of beautiful emerald green underwater plants swirling in the current. I looked carefully for koura (freshwater crayfish) along the way but didn’t spot any. Towards the end it became quite disconcerting walking along the narrow boardwalk, both of us had trouble keeping our balance right. We finally made it to the intake and bridge over the creek where most of the water was diverted into the canal with just a small flow over the rocks and into the steep and narrow gorge below. After lunch at the weir we headed on up the other side, steadily climbing for quite a way before levelling out and winding our way back around the hills on opposite side of the valley to those that we had just walked. Helpful information boards were located along the way pointing out the water race across the valley, a waterfall up another valley and a path to a lookout that gave us views back down Pupu Valley towards Golden Bay & Pohara off in the distance. Finally after 2.7kms we made it back down to the valley floor and the small power station building that had a viewing room and information boards inside. Hopefully you can read a little about the power station and the restoration. 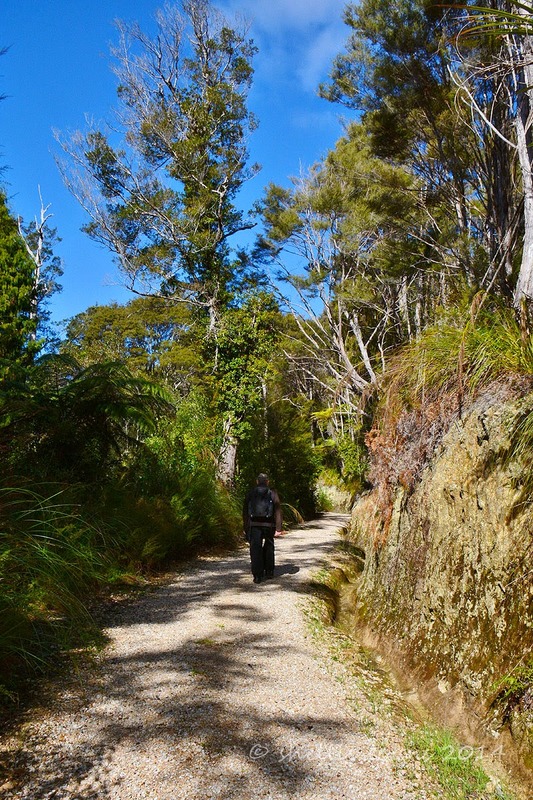 We thoroughly enjoyed this walk even though we were both feeling a little weary afterwards, it was steep & awkward walking at the beginning and quite hard walking downhill on the rocky 4WD track on the way back. 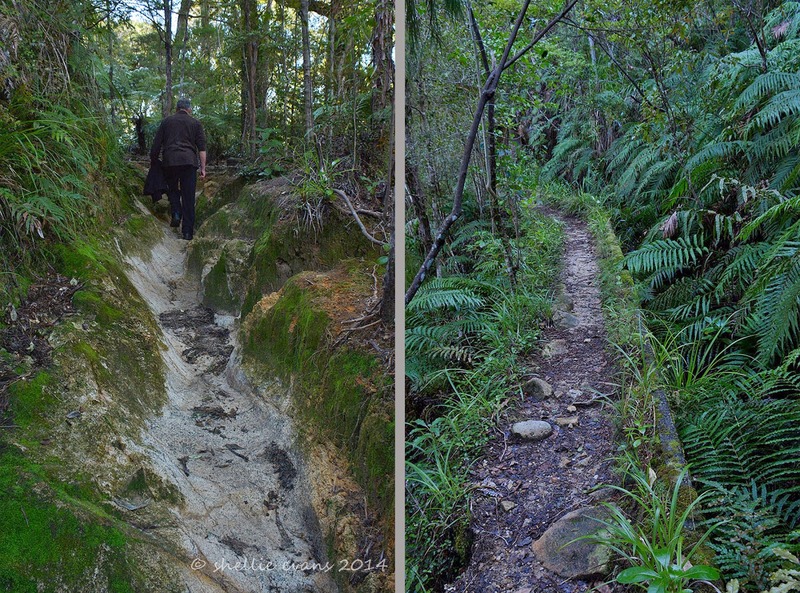 But there was plenty of interest and a variety of native forest, ferns & mosses along the way to make it worth the effort. Once home we rested up on the beach steps with a glass of wine in hand, just in time to watch the sun go down. Oh, It’s A Tough Life….